I am writing this blog from the air - the beauty of modern air travel - an hour of Internet access is only $6. Gone are the days when you could truly disconnect, leveraging the excuse that you were flying! Now when I am supposed to catch up on my reading? We just wrapped up Red Hat Summit and DevNation 2014 in San Francisco - where thousands gathered to learn about the next generation of Open Source. It is impossible to describe all that happened but I do suggest you check out a few photos and browse the Twitter or Google+ stream. #demoup OpenStack + OpenShift ^ JBoss xPaaS = AWESOME@@@!! OpenStack for provisioning a private cloud (IaaS) across a few laptops. OpenShift Enterprise (PaaS) for carving up those OpenStack created VMs into app-ready, developer-friendly containers. JBoss Fuse Fabric (iPaaS) for dynamically, provisioning those containers with the necessary middleware components, turning them into custom business integration services. Integrating Twitter to SalesForce to JBoss BPMS (bpmPaaS) based on jBPM and Drools. Mark Little has a nice write-up on the keynote. We built an on-stage private cloud out of inexpensive laptops. Checkout some of the tweets from the live event. This is not demoware, try xPaaS for yourself now! It was particularly cool to have ARM send in several engineers and suit cases full of new toys (mbedhttps://mbed.org/) for us to play with at the Hackfest - like most of the technological transformations of the last several years - open source, open standards and now open hardware platforms are key catalysts to igniting the spark of technological creative. "Push it real good", Aerogear is here with its new UnifiedPush Server and SimplePush Server. Mobile application developers have historically had to rely on relatively expensive hosted solutions for sending push notifications to APNs (Apple Push Notification service) and GCM (Google Cloud Messaging). Now there is a open source Java solution for sending native push notifications from your server to iOS and Android devices. Hijack JGroups - Bela Ban is back with a great blog on getting into the weeds with the JGroups in Infinispan and Wildfly. OpenStack - Shane Johnson explores OpenStack - a middleware developer's view of the IaaS world. 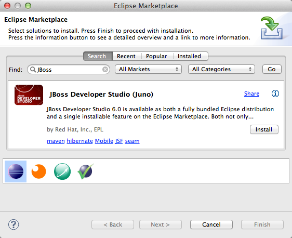 Not only have we delivered the JBoss Enterprise Application Platform 6.1.0 Alpha last week (FAQ), but we have now released the JBoss Developer Studio 7 Alpha 1 based on Eclipse Kepler as well the Fuse technology based on Apache Active-MQ and Apache Camel. That is an amazing amount of enterprise-class middleware hitting the community! Integration - JBoss Fuse Beta - you can download the new beta version, watch several videos and explore the demo source code. Tools - JBDS 7 Alpha - Updated to support JBoss Enterprise Application Platform 6.1 Alpha 1 - please download both and give it a try. You can simply unzip the application server into the "runtimes" directory of JBDS and upon restart, it will automatically detect that you have a new app server and ask if you wish to configure it. JBoss Forge 1.2.2 has arrived - our command line tools that aid in rapid application development have a new blog and video. Forge is integrated into JBoss Tools/JBoss Developer Studio - use the Window - Show View - Other - Forge Console or simply Command/Control-4 on the keyboard. (note: JBDS version of Forge is still 1.1.2 with 1.2.2 coming soon). NoSQL at HowToJBoss.com - Shane Johnson takes on the theoritical computer scientists with his posting related to Partition Tolerance. 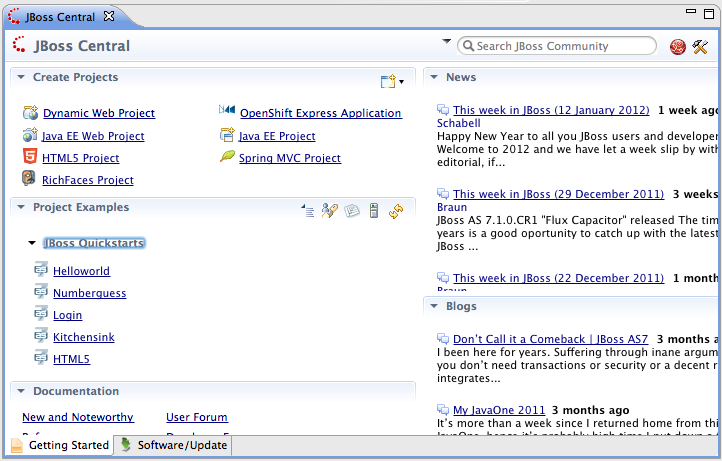 And if you have not heard, HowToJBoss.com is a fantastic place to learn more about JBoss in enterprise. jboss.org infrastructure - our jboss.org team has the thankless job of maintaining a MASSIVE developer-focused community site but they keep bringing the enhancements - check out this post by Vlastimil on Atlassian GreenHopper upgrade - get your agile on. In addition, Vlastimil also posted about to show GitHub (or Bitbucket) commits in our Jira! Hibernate and Bean Validation - Did you know Bean Validation is not standing still? Enhancements to the specification lead to enhancements in the TCK and of course Hibernate Validator. Check out this posting by Hardy. The Errai team has uploaded a series of videos from JavaOne 2012 - check 'em out. Secret Agent Tricks, also in the RHQ world, Mazz talks up a recent enhancement to RHQ to deal with those sneaky agents. The Alien Invasion continues with the Arquillian Team producing new releases of Graphene, Warp, Drone and Android. Automating your testsuite has never been easier. Hibernate Search 4.2 Final brings us Spatial Queries - The "I know where you live" edition. You can combine fulltext searches (think 'google' my database) with distance from a particular lat/long. Perhaps you can set up a real estate web app allowing users to find "all 3 bed, 2 bath houses with a basement within 10 km of current location". 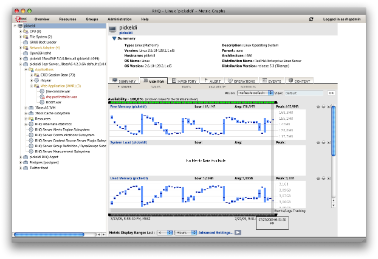 In addition, 4.2 introduces the indexing of MP3 and other binary document meta-data. Make sure to check out Emmanuel's blog for more details! This week I also wanted to highlight our RHQ project which recently hit its 4.6 Beta. 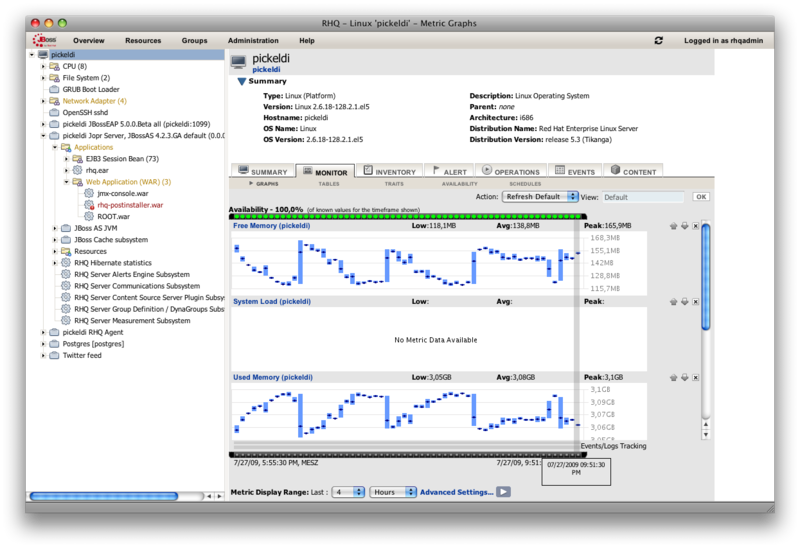 RHQ is an extensible tool to monitor your infrastructure of machines and applications, alerts based on user defined conditions, configure resources and run operations on them from a central web-based UI. Other ways of using RHQ include a command line interface and a REST-api. This goes well beyond simply starting & stopping your JBoss Enterprise Application Platform servers (aka app servers). Mike Brock publishes a few blogs on Errai @Dependent and Timing Your Methods - if you have not seen this awesome video created by Jonathan Fuerth and Christian Sadilek, please stop everything and watch it now! It clearly demonstrates how Errai helps you build richer web applications faster. Have you heard of the CapeDwarf - a framework that enables you to make your Google App Engine applications portable! Ales Justin continues to roll, check out this blog on his latest endeavors. Modeshape 3.1 is coming soon and will bring back Federated Data - Randal Hauch does a GREAT job explaining how this feature can impact your application architecture. Well that is all for this week! Brian Leathem describes his vision for Polygot Widgets - UI controls that are available via many frameworks like JSF, GWT and JQuery. Check out his awesome demo video. Gary Brown produced two videos for Project Overlord (SOA Governance) - one on Call Trace Business Activity Monitoring and another on Policy Enforcement. Eric Schabell recorded a very nice demo of using SwitchYard at OpenShift. The Errai Team talks up their 2.2 candidate release. Ales Justin unleashes the CapeDwarf - no this is not a reference to The Hobbit, it is to make your Google App Engine projects more portable! Ken Finnigan gives us the GateIn Cookbook - an excellent resource for getting your head into the GateIn game. This week in JBoss (26 Oct 2012): Objective-C? Hello JBoss Community, Welcome to another edition of This week in JBoss and as always we have a number of fantastic blogs, new releases and events to tell you about. Randall Hauch (@rhauch) published a blog that describes our JBoss Database - Modeshape :-) in When in ModeShape a good fit? In the age of NoSQL, the development world is becoming more open to a non-relational database as the backend for particular applications. ModeShape 3.0 is currently at CR3 but will go Final any moment now. UberFire (Drools likes clever names) needs YOU - If you are looking for a place to make your contribution to OSS then check out Mark Proctor's blog on Fun UI Projects we need help with. 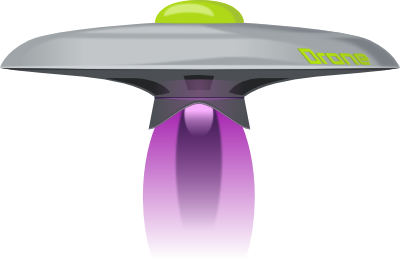 The alien invasion continues with Arquillian providing another release of the Portal Extension, the 1.0.3.Final Core release and Drone 1.1.0.Final release. Drools 5.5.CR1 - The world's best business rule, event and process engine gains Scorecards from contributor Vinod Kiran. Emmanuel Bernard opens Public Review for Bean Validation 1.1 - if you love those simple annotations (@Size, @NotNull, @Pattern) for including validation logic directly on your JPA POJOs then you should check out the BV 1.1 specification. Gary Brown is our SOA Governance Guru and he announces a new ISO standard. GateIn Portal 3.5.Beta1 is available - with Quickstarts!!! Make sure to check out our examples and send us your feedback. There is also a new release of the Portlet Bridge to support RichFaces 4.2.3.Final. Heiko Rupp describes REST/JAX-RS documentation generation, lessons learned while adding a RESTful API to RHQ. If you are serious about "web APIs" and REST check out Heiko's blog and leave him a comment. What is a Data Grid? Perhaps you have heard about our Infinispan project and the supported product known as JBoss Data Grid but it it has been unclear where it fits into your overall enterprise architecture. Check out Shane's blog entitled We, Data Grid. Finally, If you consider transactions to be the arcane and are wondering if they apply in the world of "NoSQL", please check Mark Little's (@nmcl) blog about NoSQL and Transactions. A lot happened in the Summer of 2012, so much I thought it was worthy of a high-level recap. 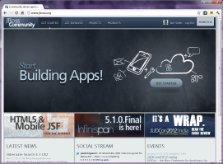 JBoss Enterprise Application Platform ships and arrives at OpenShift. Check out the many videos demonstrating how to leverage JBoss on OpenShift. JBoss Developer Studio 5 is born and is FREE - download now and try out Java EE 6 + HTML5 Mobile web development. JBoss Data Grid is born - providing enterprise-caliber support to Infinispan users. The JBoss World Keynote Demonstration is open sourced - here is a short screencast/vide to give you an overview of application. As always, the global JBoss community continues to create new code, capabilities and content. What follows are some of the highlights that I have discovered over the last week. Andrew Rubinger, published author, contributor to Arquillian and lead of the ShrinkWrap project produced a blog proposing an In-Memory File System for Java based on ShrinkWrap. Lincoln Baxter writes about Arquillian automated testing for CDI-powered applications. Scott Stark, legendary JBoss core developer, is cooking up some fun stuff with running Weld on Java SE. Plus, he also proposes a solution to support CDI-based producer methods have runtime typing. Heiko Braun talks about our internal process for defining & designing new administrative features of JBoss Application Server and wants YOUR thoughts. Max Andersen brings us JBoss Tools on Eclipse 3.7.0 (yes, that ancient version) and makes it possible to deploy on Eclipse 4.2.0 (Juno). And for those of you using Fedora as your development desktop - there is a little something for you as well - read the blog for more details. Shane Johnson describes the process of migrating from community JBoss Application Server 7 to supported JBoss Enterprise Application Platform 6 - a real customer migration story - in 22 minutes! Teiid 8.1 ships and brings back "embedded"
Hello and welcome! We have been insanely busy for the last two weeks and managed to miss an editorial publication. :-( We will endeavor to be better about our scheduling. Big changes to our various web properties have been made recently - specifically related to jboss.com and jboss.org - JBoss.com has been folded into redhat.com and hopefully all your previously bookmarked URLs are being redirected properly. Leave us a comment if you feel there is something we missed. 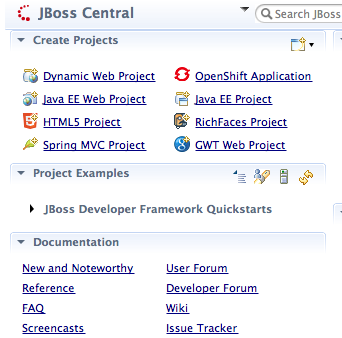 In the case of jboss.org - it has been relaunched with a new, more engaging front page - where we are making it much more obvious how to get started with building applications using various JBoss technologies. 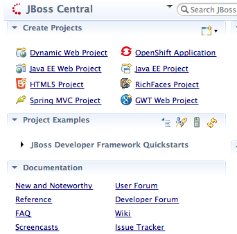 jboss.org has historically been much more of a community OSS site where contributors, both internal and external to the organization, have been able to collaboratively work on some amazing technologies over the last several years. However, we realize that we had an under-served userbase - developers whose primary focus was to build business applications on middleware, not necessarily build middleware itself. 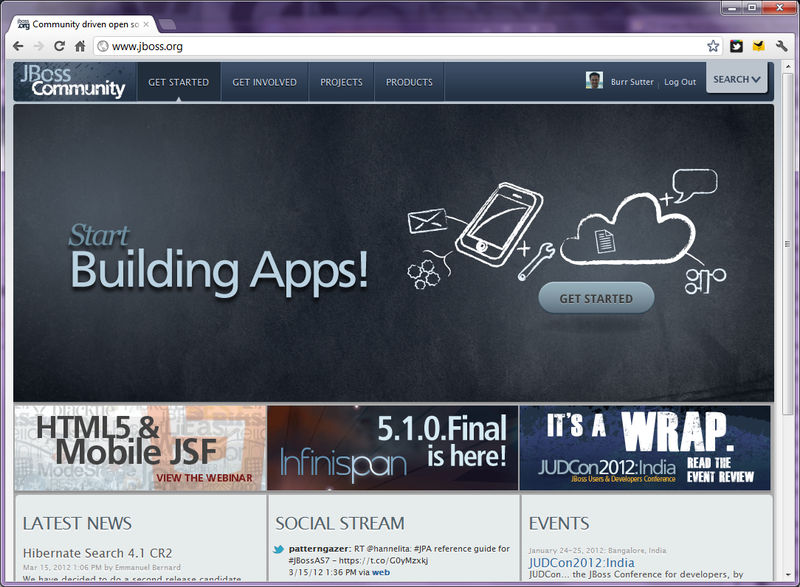 For that group, we have developed and launched a new microsite of www.jboss.org/developer. Our initial efforts have been around getting you started with HTML5 and mobile web application development and easy deployment to Openshift. And that leads me to another major delivery. This week we gave birth to JBoss Enterprise Application Platform 6 Beta - based on jboss.org's application server v7.1 and we also shipped JBoss Developer Studio 5 Beta 1 to support this new Java EE 6 offering. The bottom line is, keep you eyes on www.jboss.org/developer - more tutorials, more videos and more examples will be coming soon. JBoss in Egypt - Lukas Fryc, a member of our rocking RichFaces team, made a trip to Cairo for the 2012 Java Developer Conference. 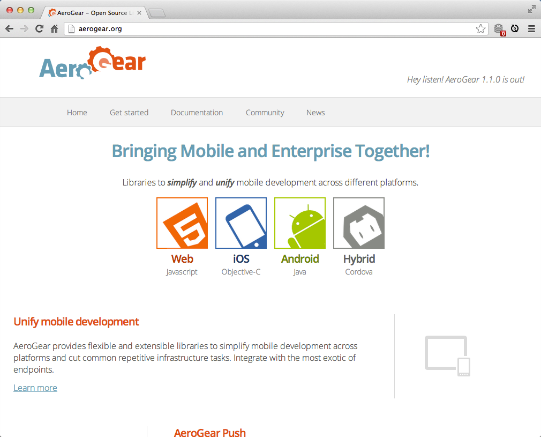 Lukas was brilliantly able to cover Aerogear, RichFaces and Arquillian and he kindly posted his slides for review. In addition, our very own Koen Aers presented and even had the time for an interview! Check out the video on his blog titled "Code like an Egyptian". Koen has been bringing Forge to life inside of JBoss Tools. We will definitely have to update some videos around Forge & Tools soon. Manik Surtani runs from the USA to Poland but still has found the time to backport Java 8's ConcurrentHashMaps to Infinispan. Memory reduction means better performance. Get the 411 on Hibernate - that is 4.1.1, we now refer to Hibernate "core" as ORM as it releases at different times from Search, Tools, Validator, OGM, Metamodel, etc. Hardy Ferentschik publishes a blog on the Hibernate Validator project roadmap - BeanValidation is part of EE6 and the OSS project that moves it forward continues to innovate. And a moving Hibernate Validator is an indicator that JBoss' Emmanuel Bernard is cranking up BeanValidation 1.1 for Java EE7. Does "NoSQL" = "No Transactions" - "I don't think" so says Mark Little in this recent blog post. :-) OK, I am paraphrasing but it is good to see that the NoSQL movement is also interested in aspects of data integrity even if they are non-relational. Team Errai continues to innovate (and blog) with numerous enhancements that extend the power of Java EE 6 to the browser with Google Web Toolkit (GWT). Christian Sadilek provides code for a MVP (model view presenter) example and a fantastic blog post explaining it. Mike Brock goes deep with Marshalling in Errai 2.0. Thomas Diesler and the JBoss OSGi team released 1.1.0-Final with over 80 fixes and many enhancements - not too mention a nice user guide. Geoffrey De Smet produces yet another great video showing off Drools Planner - have you ever had to write code to properly load a warehouse so that the most popular inventory is in the most accessible bins? Or have you had to pack and route a truck for the most efficient delivery order? Geoffrey must have worked in some warehouses as a young lad. :-) Check out his vehicle routing video and this blog on chained execution means OSS will soon solve the world's energy challenges. That's right open source software saves you gas - Go green. GateIn (eXo + JBoss) brings us Java EE 6 Portal with 3.2.0.Final - plus the GateIn project opens the proverbial kimono all the way - check out their specifications page. In addition, they have produced some nice screencasts by Nick Scavelli, I am a sucker for video - I guess because I was born during the rise of MTV (which used to actually show videos - I know hard to imagine). The Mazz (John Mazzitelli) provides us with some great insight into RHQ - monitoring custom data from DB queries - Make data a monitorable metric - I wonder if we can combine that with Drools Planner? When inventory levels drop below a certain point, kick of a Planner job to determine the best place to replenish from based on price and time. There is good in this world according to Anil Saldhana (and Samwise Gamgee) and it is Open Source and what that means to the world of information security. I have to agree OSS has made the world a better place and a more secure one as well. Google Summer of Code 2012 - Dan Allen posts about our recent submissions for the GSoC - students from around the globe will have the opportunity to participate in the open source movement. This is a wonderful program that incourages the next generation - to work in the open, collaboratively, for the greater good - and it looks great on a resume! Well that is all I have for now - JBoss has been extraordinarily active already in 2012 and the pace is quickening - more innovations, more presentations and more community. If you are one of the lucky few who managed to score a ticket to DevNexus 2012 in Atlanta, please find me and say hello. Welcome to our weekly run down of what is happening within the JBoss community. One of the beauties of living in the open source world is that it is always changing. Do you know somebody in India? No? Well, now you do. JBoss'ers from around the world are converging on Bangalore for JUDCon India on January 24th. JUDCons are our developer focused conferences - where our coders get to hang out with you! This will be our largest developer event in JBoss history. Check out the agenda for more information. JBoss Developer Studio 5 M5 - Have a love/hate relationship with Maven? I do. :-) And even if you hate Maven, this latest version of JBoss includes a much improved JBoss Central with several new archetypes for kick starting your Java EE 6 projects. Two of the most notable are an HTML5 archetype and the much improved OpenShift Express project Wizard. Our tools include everything you need for using Maven with WTP-based projects - deploying to JBoss AS7 (or the cloud) is a simple drag & drop. 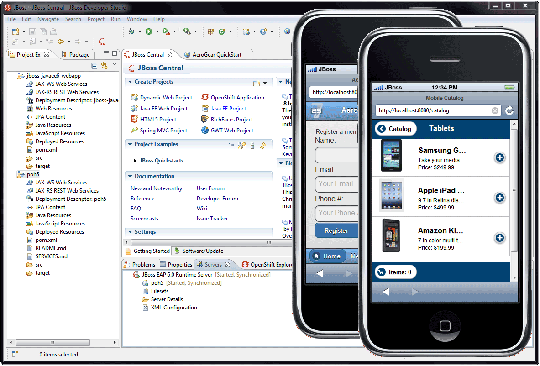 This is the fastest way to try your hand at HTML5 and mobile web development. Run the wizard, deploy to OpenShift then tweet your friends the URL for their phones - it only takes a few minutes and its FREE. Check out Max's blog for more information on M5. Jonathan Halliday is brilliant in his rant on the "perils of trying to replace or do without bits of code that you don't understand". He tosses out myth busters by clearly stating that Spring is not JTA nor JCA. If you have ever had a computer go down (and who has not?) then you owe it to yourself to learn something about transactions. Here is a tip: ACID is not (only) that stuff your parents played with in the 60's - see Steve Job's Bio for further details. The Infinispan gang continues to roll out the features and the blogs with Mircea Markus delivering a great post on transaction enhancements in Infinispan 5.0. What is a "Guided Decision Table"? I didn't know either until I watched these videos by Michael Anstis. The JBoss Drools team has been rocking the RIA with an incredibly feature rich user application called Guvnor. A Web-based UI that non-programmers can use to create business rules, processes and "spreadsheets", I mean decision tables. The title says it all Hibernate Search 4.1 is coming - our very own Sanne "The Ice Man" Grinovero just tagged Alpha1, specifically focused on upgrading core dependencies like Lucene, Infinispan and JGroups. 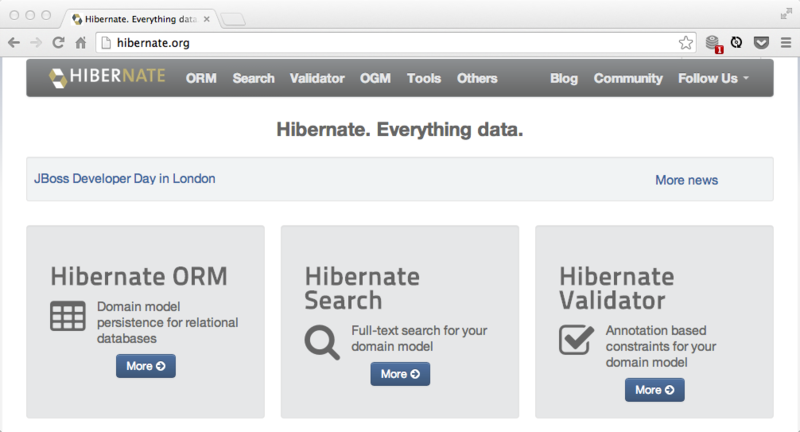 We make Hibernate happen - how is that for a tag line? I would also like to call your attention to Weld 2.0's first alpha release. Weld is the reference implementation for Contexts and Dependency Injection for Java EE. This release is the first one focused on CDI 1.1 - the next version beyond EE6. See the future, happening now. Have you had a JBoss'er visit your JUG recently? Our team is always on the move and getting out into the greater Java community. Eric Schabell published a great post about his evening with the YaJUG in Luxembourg. Ben Browning will be visiting the Atlanta JBUG to talk up TorqueBox, January 31st - Ruby on Rails on JBoss.